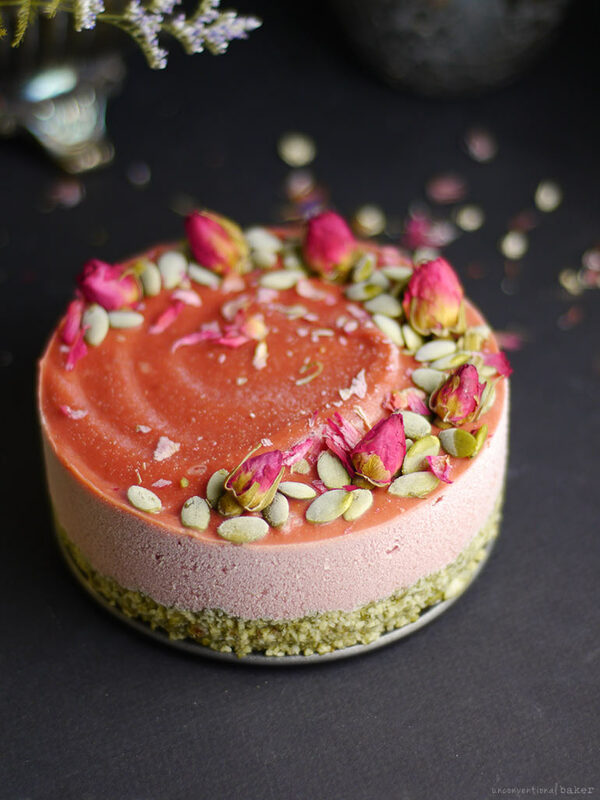 Yep, you read that right… strawberry lime and parsnip cheesecake. My latest attempt at a good dairy-free & nut-free cheesecake resulted in this beauty. Move over cauliflower cakes, bean cakes, and all… (well, don’t move too far — I still love you, but… ?) … this parsnip cheesecake takes the cake. 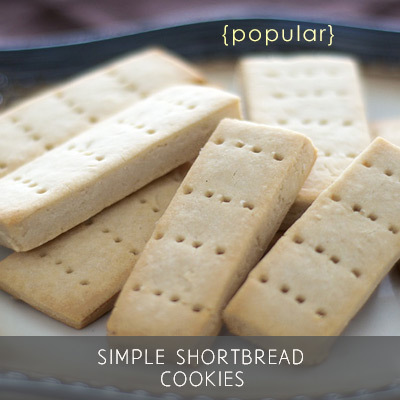 It’s tangy and absolutely delicious, easy to work with, and the texture is incredible. And the shock value on people’s faces when you tell them what it’s made of has got to be worth the effort ? Ok, kids being kids aside, I’m honestly positive that anyone would be pleasantly surprised with this cake. I’ve been working on quite a few parsnip recipes lately and got to know this veggie quite well. It has a sweet flavor that can be very distinct, but in this cake you can taste none of it. It just gives the cake a beautiful smooth (not icy at all) texture. 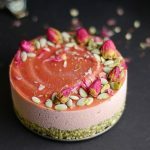 Well, the texture is in part due to the cooking of the strawberry and lime mixture, which both eliminates the iciness factor and brings a most delicious flavor to this cheesecake. 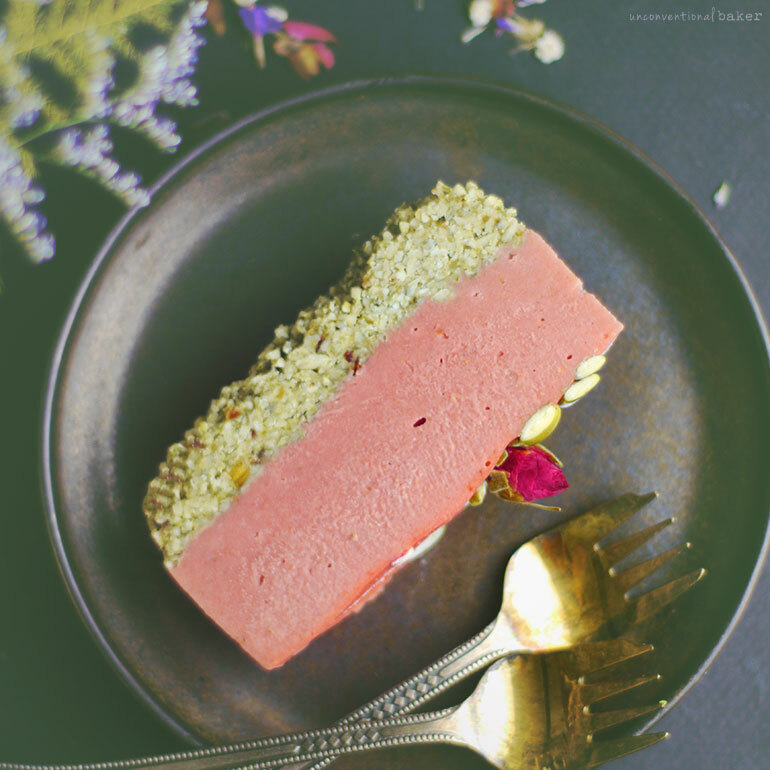 Strawberries and lime are one of my all-time favorite combos (if you’re into it, you might also like this cult favorite raw strawberry lime macadamia cheesecake or this strawberry rhubarb & lime pie recipe). I just love that the parsnips enabled the filling in this cake to be entirely nut & seed free, which not only lightens up the cake a fair bit, but is also a big bonus for those with actual allergies to nuts. 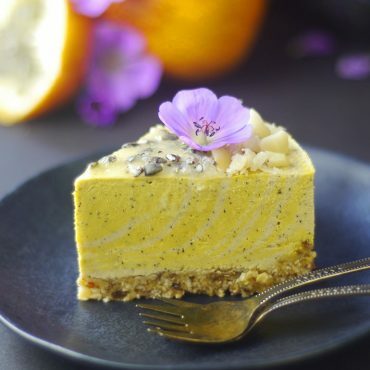 If you’re one of the latter people, you can use tigernuts in place of the pumpkin seeds in the crust — an ingredient I recently worked with on another nut-free cheesecake. P.S. 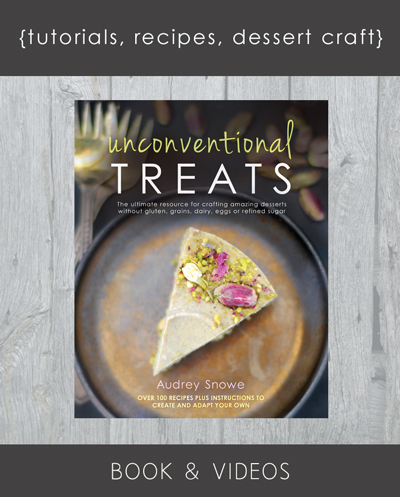 If you need more tips on how to make raw & no-bake cheesecakes like a pro, check out my book Unconventional Treats. 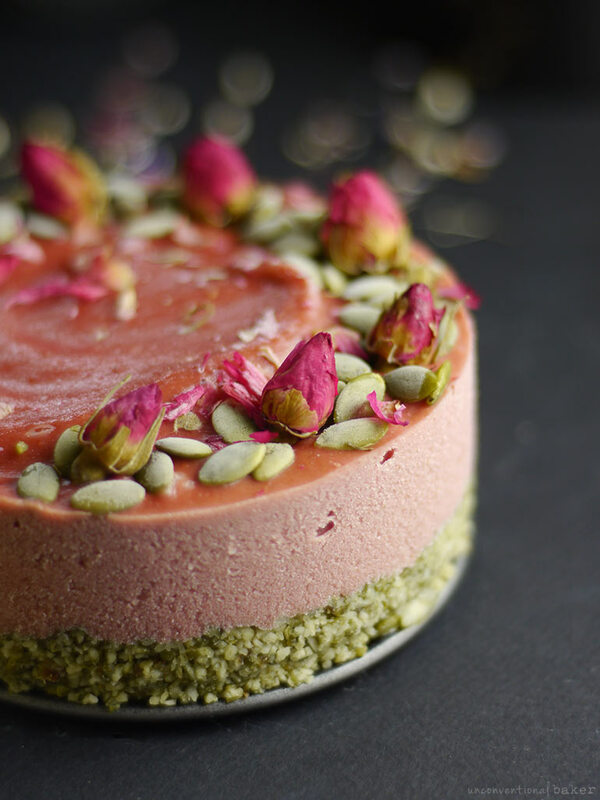 A light, fruity vegan cheesecake that’s nut-free and seed-free thanks to the addition of parsnip. Steam your parsnips (for later use in the filling layer)(takes about 15 mins until they are fork-tender)(I didn’t peel mine — just discarded the tops and sliced in half and then into quarters). Remove from heat and cool off to room temp. Meanwhile place all strawberry lime mixture ingredients in a small sauce pan, combine and bring to a light boil. Once the mixture begins to bubble let it simmer for 7-10 mins, stirring occasionally (until the mixture thickens a bit). Remove from heat and cool off to room temp as well. Process all crust ingredients into a sticky crumbly mixture in a food processor. Transfer into a 5″ springform pan and press down into a flat crust. Place the pan in the freezer while working on the filling. Place all filling ingredients as well as the cooled off strawberry lime mixture into a power blender and blend into a smooth uniform consistency. Transfer this mixture into the cake pan over the crust. Smooth out the top and decorate with desired toppings. Return to freezer and allow the cake to set for 5-6 hours or overnight. When ready to serve, remove from pan, thaw out a touch and enjoy! (keep leftovers frozen). Disclaimer: this post contains affiliate links to the 5″ pan and edible rose buds I used. Thanks for sharing! It is amazing smooth the filling comes out with parsnips! Does it keep long? This looks so good! Do you use this crust for any other recipes? Looks amazing! Thinking of prepping ahead for Xmas, how long do you think it it would keep in the freezer? Unfortunately I don’t think so. The cooking removes a lot of the moisture from the strawberries, and it thickens and caramelizes the maple syrup, and the lime (besides adding flavor) also acts as a bit of a gelatinizing agent. The cooked mixture ends up being more potent / concentrated in flavor, not too runny, and has a good “bindiness” to it which helps the cake hold together. Wow Im gonna make this for my sons birthday next month. Can I substitue tapioca with some other flour? Thanks for all the wonderfull recipes, I LOVE IT! Thank you for the beautiful feedback, Jeannie! :) Made my day. Aw, best feedback ever, Sarah! :) So glad you enjoyed it. Happy birthday to your little one. Hi Audrey! 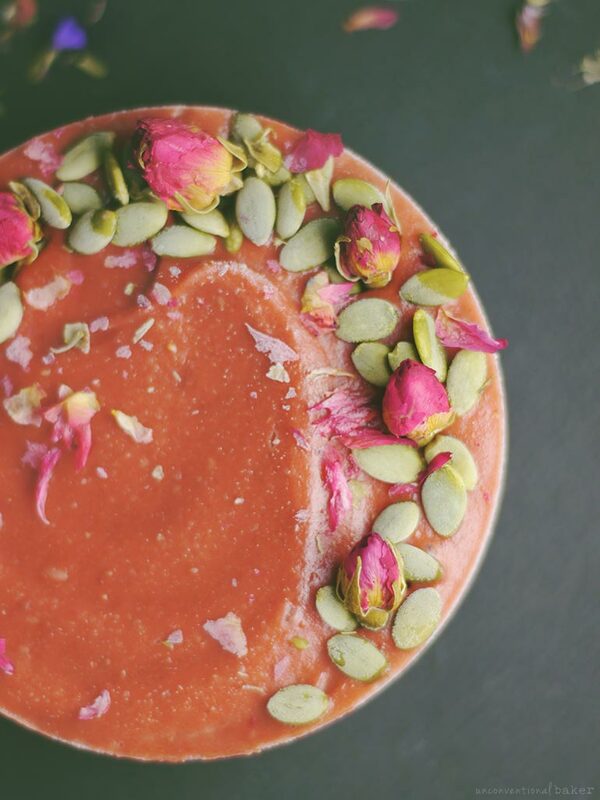 I just found your recipe looking for nut-free vegan cakes and this looks lovely! Except we don’t have parsnips where I live :( I don’t even know the texture they have as to look for a substitute… Do you think steamed/cooked cassava could work? 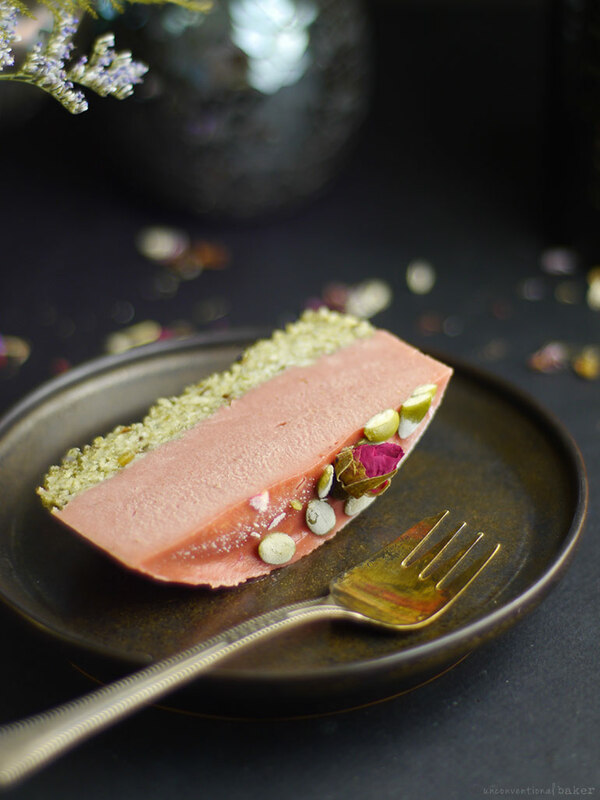 There are actually quite a few nut-free options on the recipes page — have you seen them yet? Maybe something from them will work? (There are avocado cakes, bean cakes, cauliflower cakes, coconut cakes, etc.). She did in fact ‘want to’ and gobbled up the rest of it without a second thought! :) Nice one Audrey! Haha, nice! :) She really made me laugh with that one ? Wow, I’m intrigued! 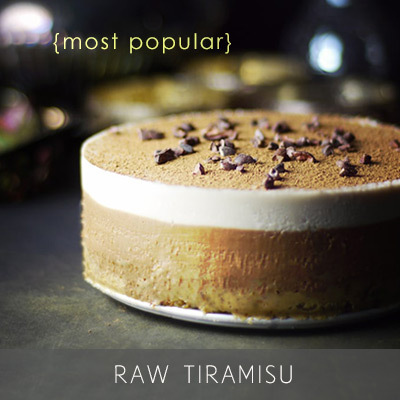 Is the texture similar to regular vegan cheesecake, even without relying on nuts and soy? I don’t think I’ve ever had a cheesecake where the base was fruit flavored (only ever topped with fruit sauce) except with lemon. I’m wondering if this would work with other flavors like chocolate, vanilla, or lemon? Can’t wait to try it this weekend! Hi Chan — yes the texture is great — quite similar to cheesecake. I loved it. 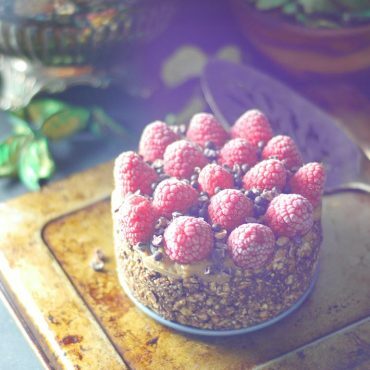 If you’re curious, look under recipes on this site and select the “cake” and “nut-free” tabs and you’ll see a whole series of cheesecakes that are nut-free and soy-free in all kinds of flavors. It’s sort of something I like exploring a lot ? With regards to this particular cake using parsnips, you can definitely play around with the flavors a fair bit — like change out the fruit or do chocolate, etc. The only thing is, and I say this because I’ve been playing around with parsnips in sweets the last few weeks, is that depending on the flavor the parsnip flavor can come through — which was a negative for me. So in this case the strawberry & lime mixture overpowered that quite well. 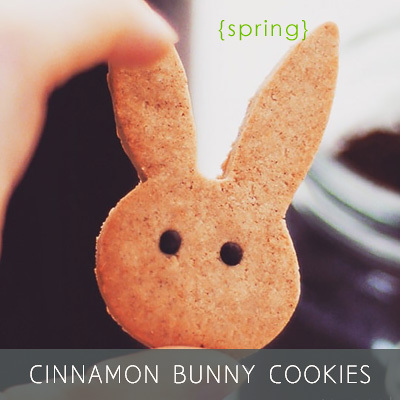 In other cases I found adding a bit of cinnamon helped with other flavors, etc. So you’d just need to adjust the taste to your liking. Hi and thanks for the response! I will definitely be experimenting then. I checked out your other cakes (they look soooo yummy), and plan to try the cauliflower ones as well. Quick question: does the chocolate bean cake have the same texture of cheesecake, too? I’ve been obsessed with cheesecake for some reason lately. The bean one is wonderful, but only works in a chocolate flavor to mimic a cheesecake. I’ve tried it with other flavors and the texture just wasn’t quite the same. I’d say on a scale of personal favorites, this parsnip is the best. And the chocolate cauliflower one is my next favorite from the veggie series :) The bean one is my husband’s favorite. I love making your cakes. They’ve all been so good so far. Made this cake yesterday. Delicious! I made this cake with cherries instead of strawberries because that is what I had on hand. Can’t wait to try this recipe. Love that it is nut and dairy free! Just need to buy some parsnips. Awesome — glad it works :) Enjoy it!